The ferry is crookedly looking and I don’t want to take it. Coen does though, and there are two 4x4s from Eco Adventure going as well. The drivers inform Coen we better cross now: the tide is low, which makes the whole trip ahead much easier than with high tide. And so off we go. 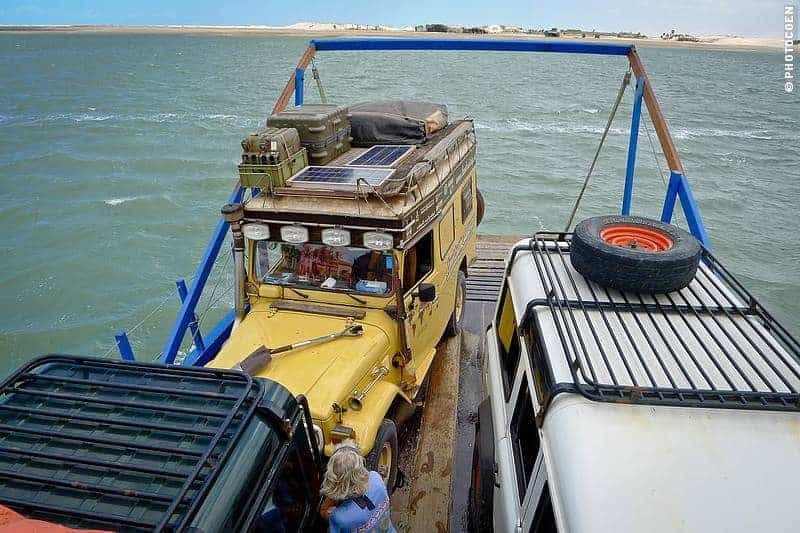 We survive the crossing and follow the Eco Adventure guys. More dunes and sand. We’ve had our share of those today and it hasn’t exactly been as I had expected it to be. This morning it had been four kilometers of dunes to get to a beach from where we might be able to beach drive east. We followed a path that cut through dunes along small, self-sustaining farms. I got out of the Land Cruiser to coach low-hanging cashew branches over the roof until we came upon one tree that’s too big, the low-hanging branches too thick: it had been a no-go and we had to turn around. We tried another path. It led deeper into the dunes to a viewpoint of windmills. The dozens of slowly turning white-red structures looked impressive enough but the trail stopped there. We turned around once more and drove around the other side of the lake where we had camped the night before. More low-hanging branches and Coen talked to a farmer about what else we could expect down the trail. The farmer responded it hadn’t been maintained in ages and that there would be more trees blocking our path. “I don’t go to the beach anymore, not since they built those windmills. I am afraid of them,” he said but Coen couldn’t get him to explain what’s so scary or dangerous about them. There was one last try, all the way east around the lake, however, we’d have to pass the gate of the windmill company, the farmer informed us. We gave it a try. The guard was kind enough, wanting to help and radio-ing his boss to ask for permission but again it was a no-go. The air pressure in the tires was down and we had a thirty kilometers of laterite and asphalt to cover. We tried the air compressor we have carried with us during all those years but which for some reason we never used. The compressor didn’t have the power to fully inflate the tires and the little machine got dangerously hot. We didn’t want to push it and turned it off. It has helped sufficiently and we drove on to Camocin. That’s where we I thought we met our next no-go: a rickety looking ferry. Coen on the other hand, has set his mind on covering the next 300 kilometers to Fortaleza via the beach, and so thus we crossed. I appreciate the gesture of Eco Adventures to allow us following them. You do have to know where to drive here. The beach is vast and empty, and easy going. 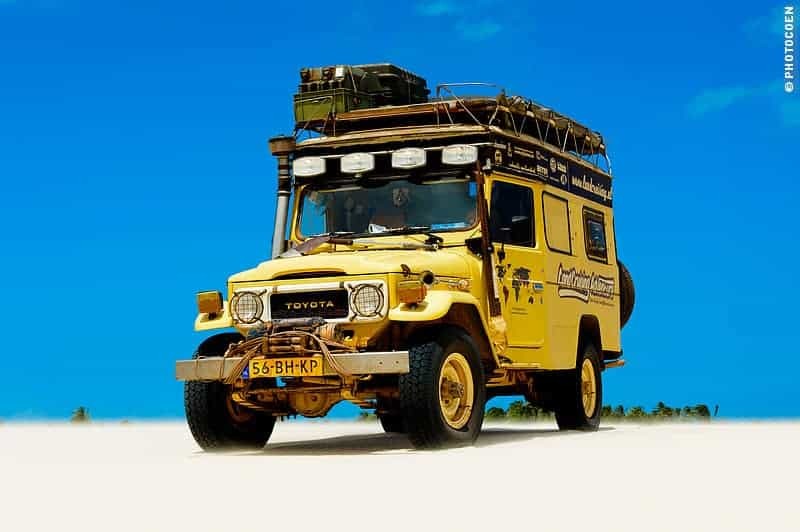 On some stretches the sand is so firm that Land Cruiser virtually leaves no indentations at all. We cross saltwater streams, wind through dunes and valleys, and then suddenly are driving up a dune. This is not my idea of fun at all. What if we get stuck here? Fortunately, the Land Cruiser handles the thick sand with aplomb and I relax a bit. From the top we have a view of waterways, palm trees and dry vegetation. “Let’s go have lunch,” one of the Eco Adventure drivers suggests and I confirm we’ll follow once more. Contrary to what I think he’ll do, he isn’t turning around but disappears out of sight right in front of me, as if he has fallen off the planet. “Ho! Stop! What’s going on?” I step down the Land Cruiser and walk to the edge. Holy cow, that car just went down a vertical hill. Is that guy out of his mind? “Forget it. Another no-go for today,” I sign language to Coen who is waiting behind the steering wheel. The second car is getting ready to go down as well. I don’t even want to watch it. Coen does and subsequently wants to go down too. Yep, I’m sure it’s easy if all goes well. But it’s not worth the risk. It doesn’t happen often that we remain opposed to each other on an issue like this. Generally one of us gives in without much of a discussion but this one remains hanging in the air for quite a few days. We follow the cars to Lagoa da Torta for lunch. 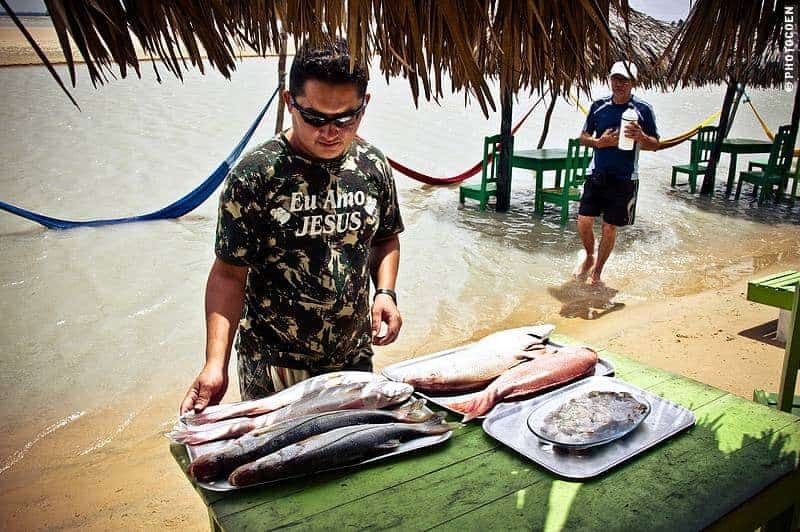 It’s a touristic place run by two families from a nearby fishing village. Tables and chairs stand inside the water under thatched roof canopies and there are even hammocks in the water to chill with your caipirinha (lemon-rum cocktail) – a typical Brazilian scene of restaurants and bars along waterfront. Unfortunately, we are being sandblasted. 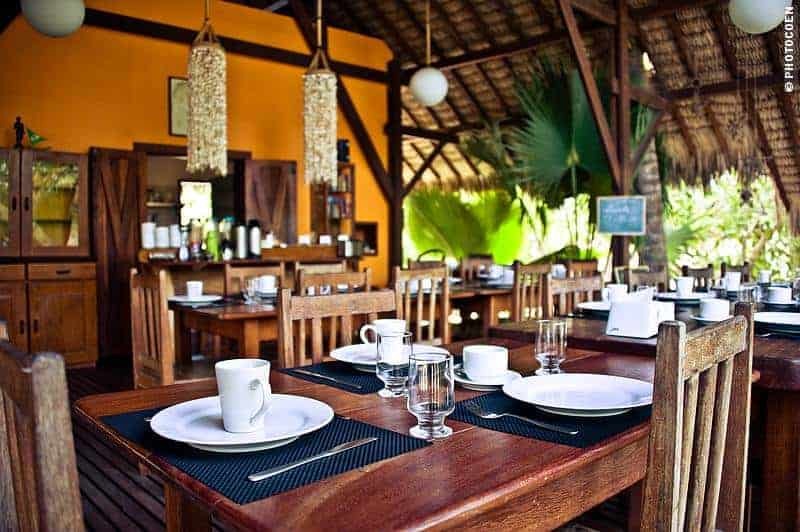 We flee inside where we are served an excellently grilled fish but the side dishes of rice and beans are about the worst we’ve ever had in Brazil. We say our goodbyes to Eco Adventure and return to the vertically walled dune to rough camp with the thought that the dune will function as a windbreaker. It doesn’t; sand and dust are flying around all over the place. It’s three pm and we’ve locked ourselves in a hot car because it is impossible to sit outside. We try various spots but all have the same result. We’re not exactly enjoying ourselves. 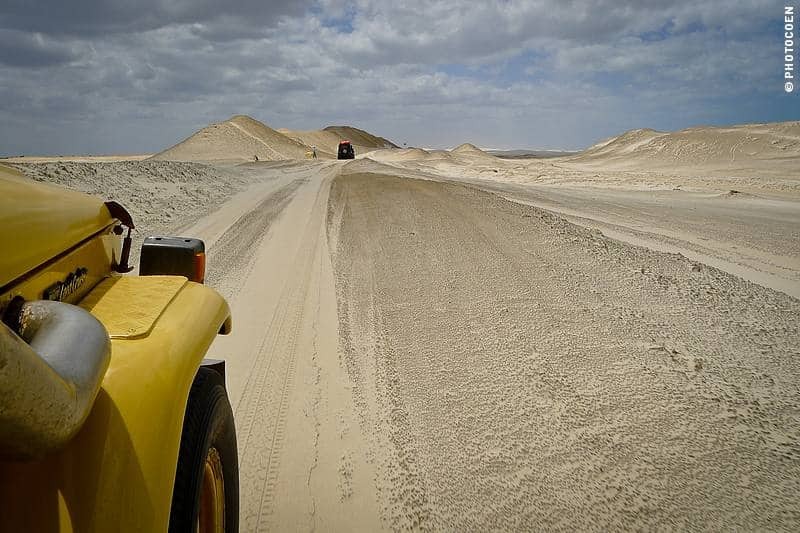 Another 300 kms to Fortaleza? I am having some doubts about this adventure. A local guy stops and says we should go to the mouth of the river instead. We cross the village of Tatajuba and drive onto a beach. Kitesurfers. Lots of them. This, we learn, is one of the world’s best kitesurfing beaches thanks to a daily, consistent wind force of 6 to 7 Beaufort from July to January. On the beach is a shop run by Kite World Wide (more info below), which rents equipment and runs a kitesurfing school. When driving onto this beach we were convinced we’d be moving on rather quickly. It had been a day of no-gos, either because of landscape or because they were self-imposed. This whole attempt of trying to follow Brazil’s coastline hadn’t been successful nor a lot of fun. However, you will have to wait a bit to turn about the next phase of beach driving because, well, we met people again: Fantastic people, kindred spirits, adventurous souls. 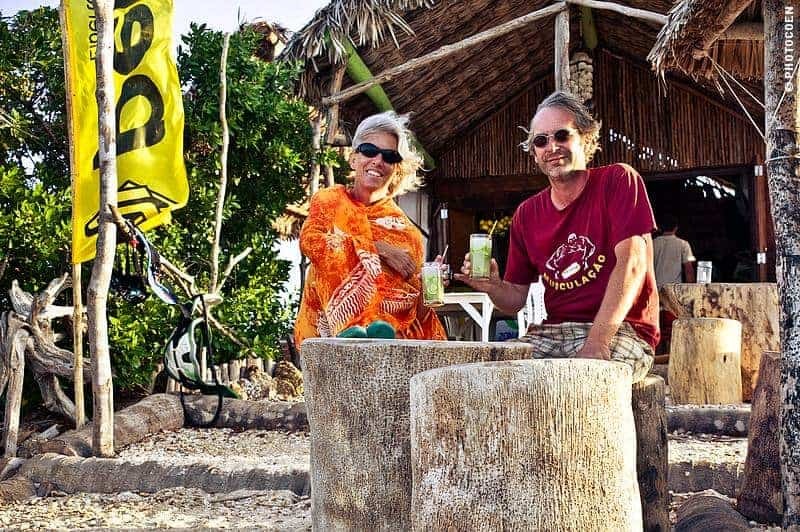 We will hang around Tatajuba for a bit, taking up a kitesurfing course and drinking caipirinha with Sandra and Marcel who are running a high-quality guesthouse up the dunes (more info below) – and who handed us the keys of one of their accommodations. Thanks, guys! 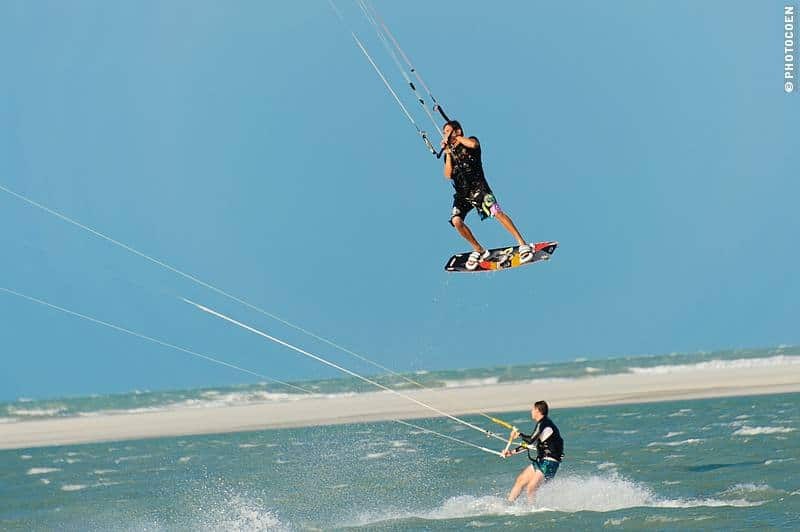 Kite World Wide organizes exclusive kitesurfing vacations to far-flung destinations, away from crowded lagoons and windless spots. 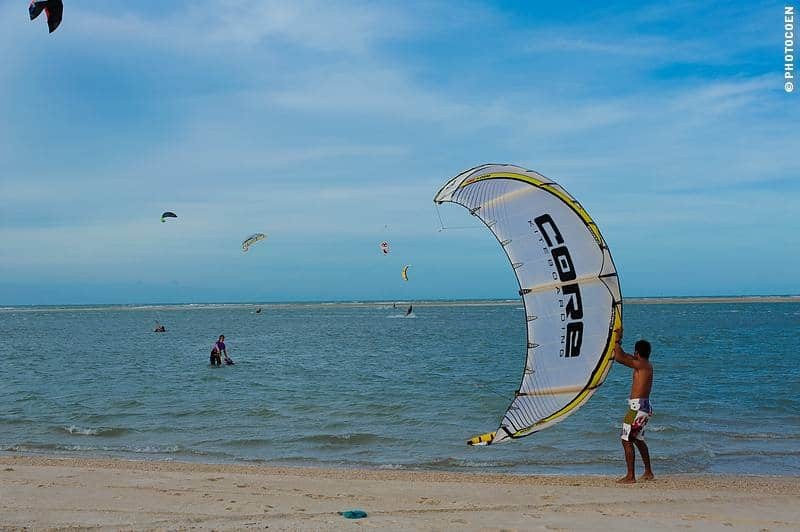 On their list are kitesurfing beaches in, among other places, the Caribbean, Cape Verde, Morocco, Croatia and in Brazil (among which Tatajuba). For more information check out their website or follow them on Facebook. Pousada Portal do Vento lies along the beach of Tatajuba, some 300 kms west of Fortaleza (state of Céara, northeast Brazil). It’s a place for the adventurous but also for visitors seeking tranquility as the fishing village of Tatajuba is one of the remotest spots you can imagine. 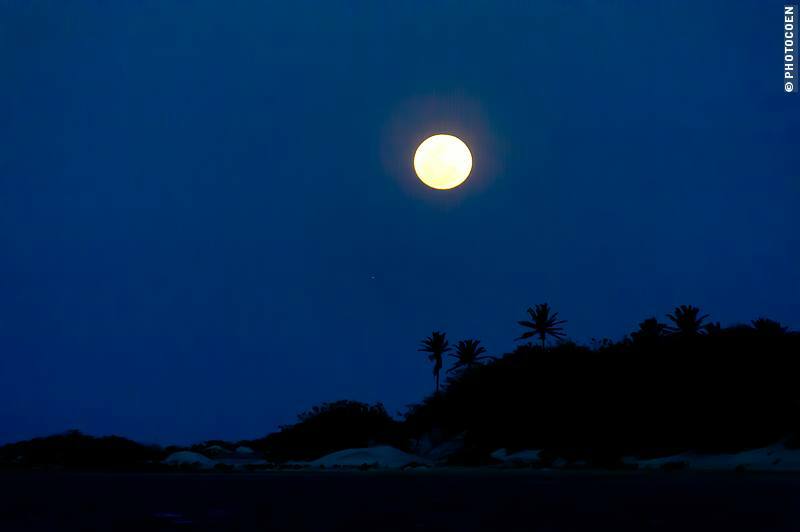 It can only be reached by four-wheel drive or a buggy, which crosses dunes and beaches to get here. The guesthouse has comfortable accommodations (max. 20 people) and a high-quality level of service (read more here). Edited to add in 2017: Sandra and Marcel no longer run the pousada, but Kite World Wide does. Find their website here.